Instructions on how to set up an Easter egg hunt for kids. You can also replace the eggs to organize a treasure hunt. Scroll down, and plan for the day now. The Egg hunt is one of the most popular games associated with the Easter holiday. The egg symbolizes rebirth, the spirit of the Easter celebrations, and a number of fun games have come to be centred on this white, oval shaped beauty. 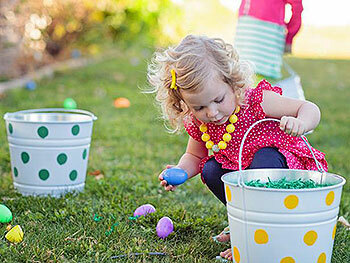 Check the steps and have a fun time playing the Easter Egg Hunt. 4) Treats like jelly beans, small chocolates or money. 1) Make a simple map of your house. Hang this from your living room wall for everybody to see. 2) Purchase plastic toy eggs (quanity depends on the number of players) of the same size. 3) Use various paints to colour the eggs as decoratively as you can. This is only if they are not decorated already. 4) Fill each egg with small candies or other goodies. Put small treats as well as money inside one egg along with a note "For the Champ". The one who gets it is to be declared the winner and he or she has to pool all the treats as well as the money collected by all and distribute them equally among all the participants. 5) Hide the eggs in places where they can be found with a small effort. Flower beds, flowers pots, high patches of grass, the the bottom of trees make great hiding places. 6) Call the players and instruct them to look for the concealed eggs. NOTE: You can also introduce prizes for different types of achievement, such as for the maximum number of eggs collected, for the biggest egg, the smallest egg and the like.